PayZapp an application launched by HDFC Bank. 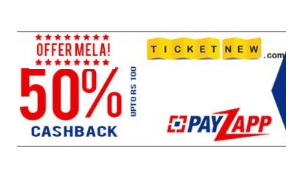 PayZapp app is back with another great offer, providing Flat 50% Cashback on Booking movie tickets on Ticketnew app (Upto Rs.100 only). You can transfer this Cashback amount direct into your bank account easily. So the Cashback you receive its the real money! That’s it! You will get 100% Cashback upto Rs.50 within 72 hours into your PayZapp wallet.